Last edited by JeasonOK on Thu Aug 17, 2017 8:59 am, edited 1 time in total. I'm not aware of compile lua files that start with those bytes. You forgot two mandatory things when opening a topic here: name of the game and sample file. #calldll "netc.dll" "InitNetInterface" "__stdcall" CNET   # useless and quickbms can't do "[CNET]+0xa0"
A bit off topic, but related to LUA, is there any reliable way to decompile 5.0.1? Luadec and unluac.jar don't handle it. I can provide a sample. Sorry for such a stupid question, but i was using the code posted above, and got an error. So, what is that error means and is there a way to fix it? Probably you are using a version of netc.dll which is not the current 1.5.4. It's clearly written in the notes. It has been successfully tested with both the normal and xp dll (on both winxp and win 7, 8, 10). Thx for the tip. But now there is another problem. I thought I would be able to decrypt the resulting file by the old methods (luadec and unluac), but they are not able to perform this task even after deobfuscation. Got to find something that may help me doing this. Hello, i found a code on this forum to encode luac scripts from MTA but this is only working with old files. Is there any way to make this program working for new luac files. I think they added a new feature on the compiler system, but im not sure. Merged the post in the previous topic. So do you mean there is a new encryption method or something similar? Have you used the dlls from version 1.5.4? It was confirmed to work correctly. I have tried to decode luac files from 1.4 and it was working. Then i tried to decode luac files from mta 1.5.4 with the 1.5.4 dll’s. it removed the extra obfuscation from the file but when i try to uncompile it with another program named ‘unluac’, im getting a empty file. Maybe unluac got a problem or mta made something new in the compiler. Can somehow decompile this code? I used the script for MTA (result - client_core_decrypt.luac), but it did not change much. Unluac cant help. Post moved in the original topic. Check the topic in case there are some useful information. I think that this is still possible. 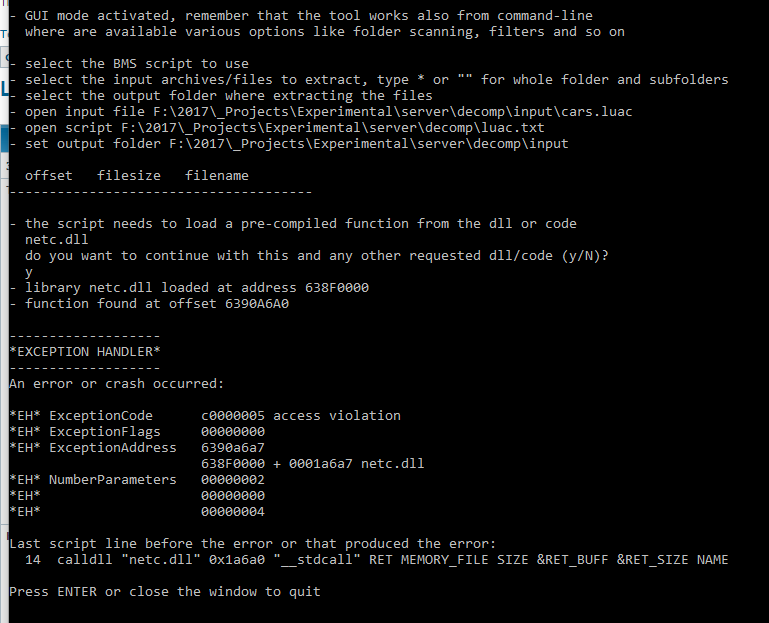 The script from the archive is partially decompiled, maybe this will somehow help. Is it compatible with version 1.5.5?